Bringing over the story of a new documentary about the universality of small towns from weelunk.com. Blessings! WHEELING, W.Va. — The odds are good you’ll see someone you know on screen if you attend the Friday premiere of a feature documentary focused on Moundsville. Marc Harshman, state poet laureate, is among those interviewed. So is Eugene Saunders, that city’s former mayor. Interestingly, those who watch the film at its Pittsburgh launch next month are also likely to see someone familiar — even if they can’t put quite the same name to him. That’s the point. John W. Miller, a former foreign correspondent for the Wall Street Journal, hopes Moundsville will strike a chord with those who knew Fostoria glass and Marx toys. And, with those who knew the heydays of Donora, Pa., or Gary, Ind., or the Pittsburgh steel mills. Or, even the Belgian rustbelt south of his own hometown of Brussels. Miller, now a Pittsburgh resident with dual American/Belgian citizenship, was in Marshall County this week, talking with Weelunk and passing out flyers advertising the premiere. A chocolate donut now in one hand, Miller is in search of coffee. The high-octane interview eventually makes its way to Wheeling’s Later Alligator, where Miller has a French press and explains more about how Moundsville came to be. It was, in fact, exactly what a journalist burnt out from global travel and the divisiveness of modern politics was seeking. Miller quit the Journal in December 2016 and repackaged himself as an indie writer who now hopes to tell the kind of stories that will help America heal. His freelance work ranges from a business column on global trading to opinion pieces for Buzzfeed.com to the story of private reparations made to the descendants of slaves for America Magazine, a Jesuit publication. And, there’s the Greater Pittsburgh Arts Council-funded film, which, oddly enough, started with finding a paranormal shrine at a hotdog stand on the way home from covering a coal story for the Journal. That’s not so far from the truth, even though Miller’s own folks chose Europe over American cities of any size. Former Maryland residents who found a music career in Brussels in the 1970s, his parents sent Miller to French-speaking Belgian schools instead of those dedicated to the children of other American ex-pats. He has dual citizenship and a keen eye for universal similarities as a result. In Moundsville, Miller and Bernabo found a broad cast of characters doing that very thing. There’s Saunders, the city’s first-and-only African-American mayor. He’s lived in Moundsville through the industrial boom and its 1980s implosion. There’s Alexis Martinez, a 24-year-old son of Mexican immigrants who dreams of medical school. There’s poet Harshman and a host of other elder townsmen who have obviously thought through Moundsville’s place and time at great length and depth. And, there’s the mound that gave the city its name. Built from an estimated 3 million basket loads of soil by the Adena people, the 2,200-year-old mound’s very presence is as central to the film as it is to the city. A tourist attraction in Moundsville’s evolving economy, it is also a looming testament to the fact that times can change to the point of obliteration. What happened to the Adena, happened to Fostoria and its industrial kin. They are gone. And, that touches Miller, who has seen communities all over the world struggling with the same loss of an era. “These places really were the most prosperous places in the world. They made airplanes in Moundsville … Their toy factory was the most important one in the world,” Miller said of what disappeared locally. That in mind, he is disappointed that much of the news narrative of such losses has focused on fallout — particularly the political (the sea change illustrated by U.S. President Donald Trump and the rise of like-minded leaders around the globe) or the epidemiological (read rampant opioid overdoses). Miller believes journalists are often missing a different story, the human-scaled one. Grief, or at least sadness, can certainly be felt in Moundsville. The loss of job opportunity. The loss of family continuity and sense of place. The loss of pride in products made well. Moundsville isn’t just a sad story, however. Miller said the reason he wanted to tell a universal tale through a specific small town was about healing and the future. The film, indeed, presents the city in pleasant light. Tight camera shots emphasize the tidiness of neighborhoods. Soft-focus effects make even Walmart look kind of dreamy. Speakers come off as reflective and endearingly quirky. Story arcs cover the city’s move toward tourism, particularly concerning the mound’s rich Native American history, New Vrindaban and paranormal tours at and associated with the shuttered West Virginia State Penitentiary. Miller also sees hope in the shared history of those who remain — the city’s population has halved to about 8,000 since its peak. Party-centric news may be playing at McDonald’s, he said, but the real future of Moundsville isn’t as much about what’s happening in Washington, D.C., as it is about that shared history and community. Reality is, he believes, the new football field at John Marshall High School, the new jail or the ethane cracker plant many city officials hope will eventually materialize just across the Ohio River. Not to mention what’s not there yet. Will New York chefs eventually make their way into rural West Virginia, opening up shop in derelict buildings as they have in Pittsburgh? 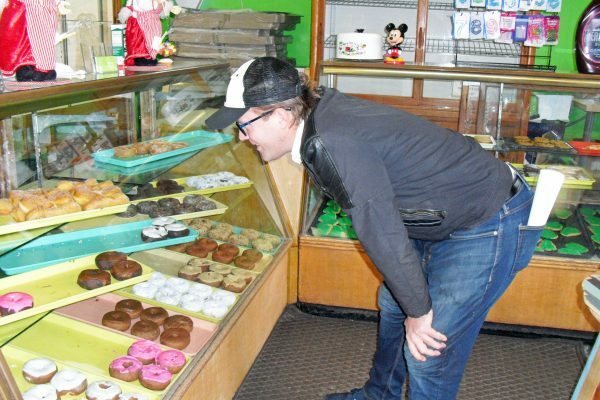 Will the “best donuts in the world” find a larger venue? Will young residents find wildly creative ways to make a living in a new economy — as some of the film subjects are already attempting? Or, will, as one Buzzfeed reader snarkily suggested in response to Miller’s opinion piece about the film, they just wise up and move to where the jobs are? Miller doesn’t know. But, he can hope. “West Virginia, oh my home …” the aspiring banjo player literally sings over his coffee at one point. The lines are from a Hazel Dickens song he learned at Clifftop, a string band festival near the New River Gorge that he describes as Burning Man for folk musicians. “Moundsville” premieres 7 p.m. Friday in the Strand, the city’s restored 98-year-old theater. Admission is $5 per person at the door or online. Beginning Dec. 15, the film can also be rented or purchased online. It will additionally be shown in Pittsburgh Jan. 17 at the Carnegie Museum of Art. Watch the trailer here. Previous postI lost baby Jesus!